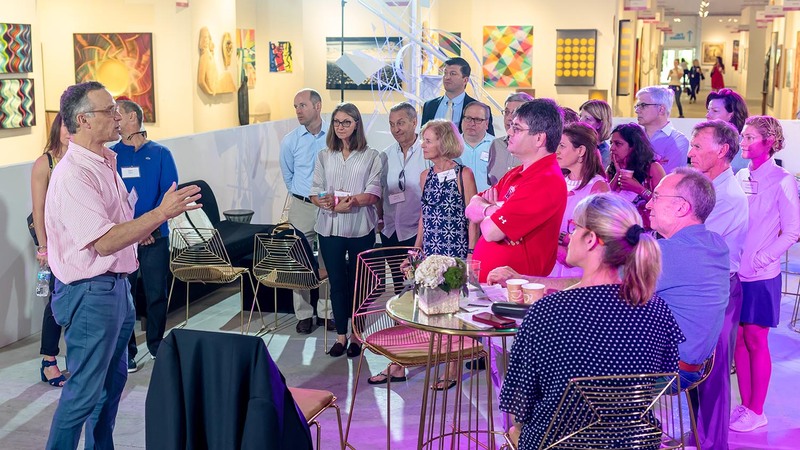 As part of Art Miami‘s 29th annual art week held Dec. 4-9 in Miami, Fla., several alumni, parents, and friends attended a brunch with Wesleyan President Michael Roth ’78. 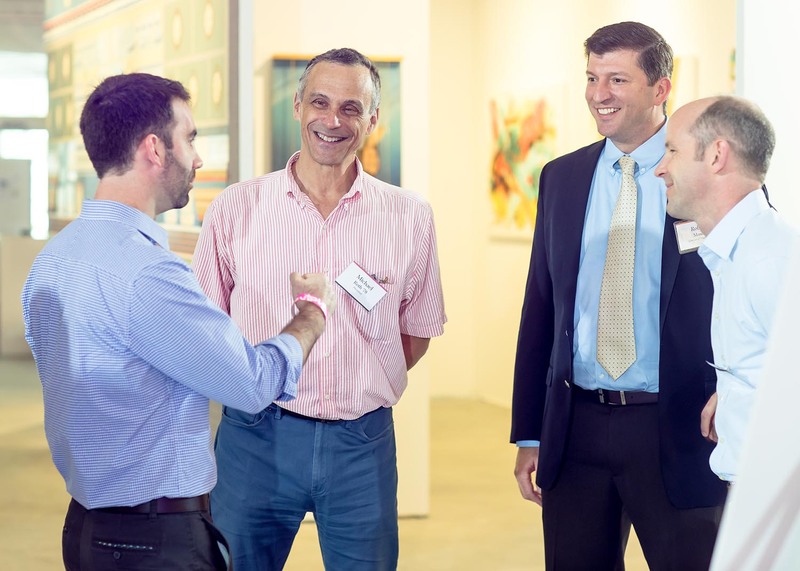 The brunch included a general day pass to view three fairs at Art Miami, CONTEXT Art Miami, and AQUA Art Miami. Former Wesleyan Trustee Alberto Ibarguen ’66, P’97, Hon.’11 introduced President Roth at the brunch. Ibarguen is president and CEO of the John S. and James L. Knight Foundation in Miami. Wesleyan President Michael Roth and Viral Doshi spoke about the value of liberal arts education at an event in Mumbai, Oct. 22. On Oct. 22, President Michael Roth held a public discussion in Mumbai, India, with leading education and career counselor Viral Doshi on the value of pursuing a liberal arts education. 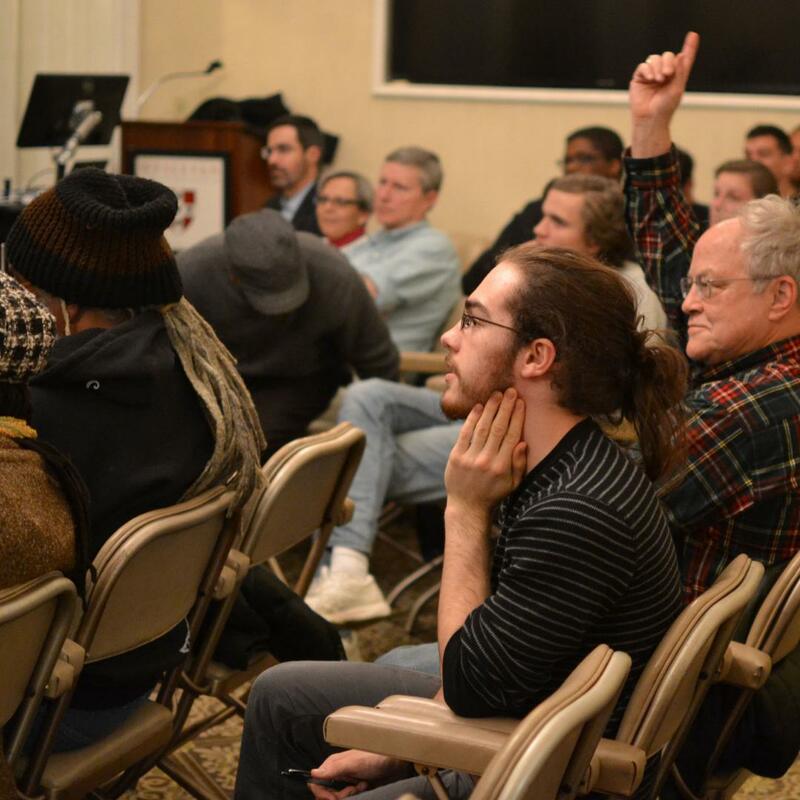 Nearly 90 people, including many alumni, parents, prospective students, and high school counselors, were in attendance. Over the past decade, an increasing number of students from India are choosing to pursue higher education in the United States. 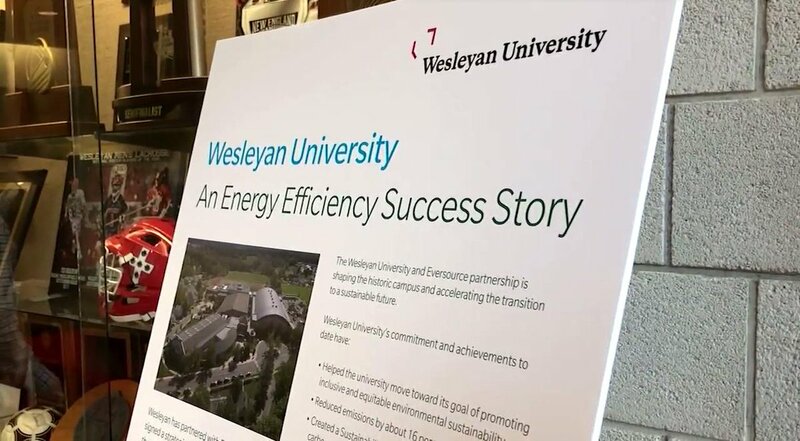 Wesleyan has seen applications from India increase by 70 percent over the past 5 years. 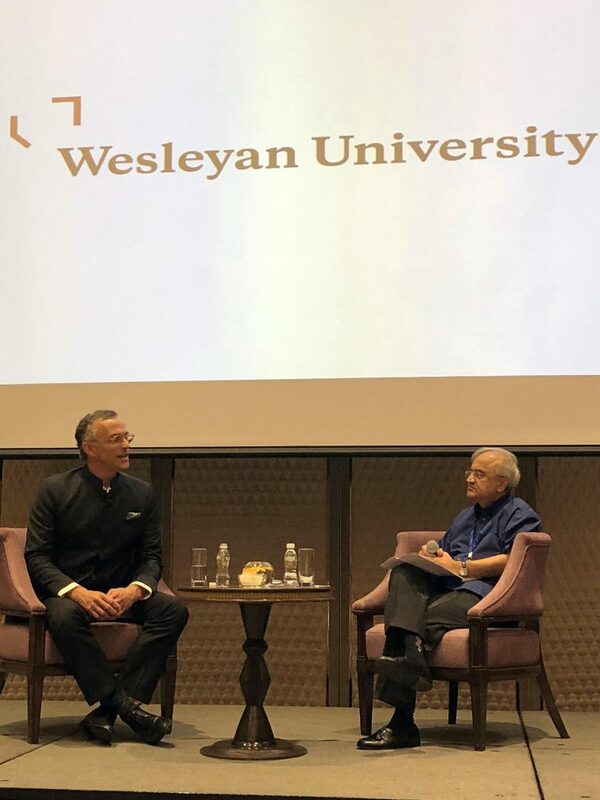 At the event, Roth spoke about the educational experience offered by Wesleyan, while Doshi shared his perspective on and insights into current trends in higher education. He is the founder of Viral Doshi Associates, which provides students and young adults with services ranging from psychometric testing and mentoring to career and college planning. 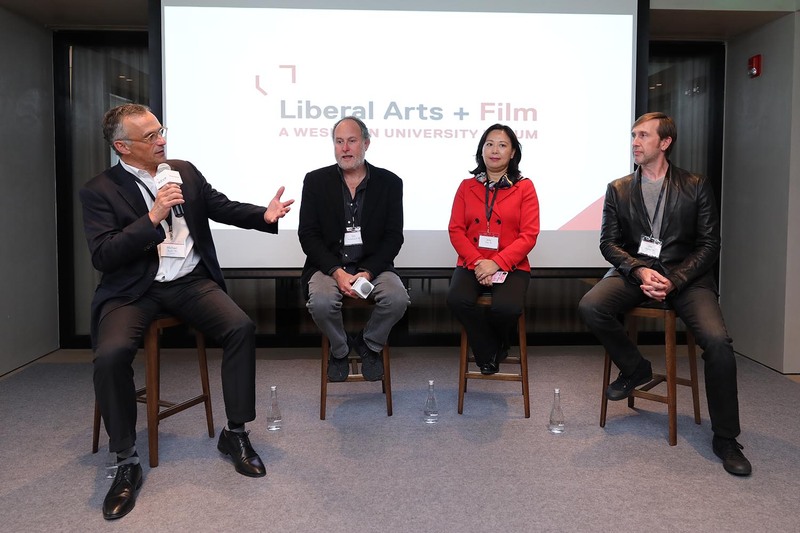 President Michael Roth moderated a discussion with alumni in the entertainment field—from left, Jon Turteltaub ’85, Julia Zhu ’91, and Jon Hoeber ’93—on “practical idealism in action” at the inaugural Liberal Arts + forum in Shanghai on Oct. 20. 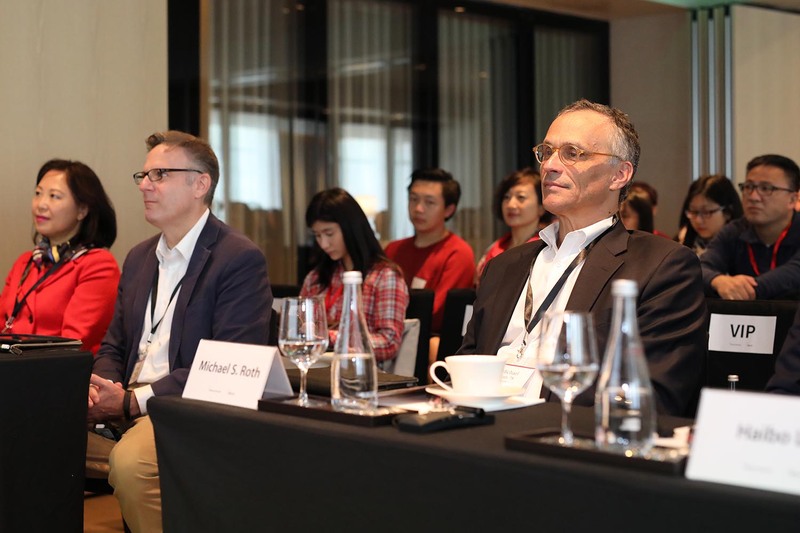 On Oct. 20, Wesleyan held its inaugural Liberal Arts + forum in Shanghai, China. This year, the forum focused on film education and U.S.-China film collaborations, and featured discussions between three alumni in the entertainment industry; President Michael Roth; and Scott Higgins, director of the College of Film and the Moving Image. 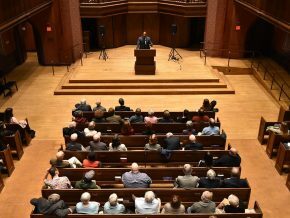 Each year, the forum will highlight a different area of liberal arts education for an audience of prospective families, alumni, and the general public in China. The centerpiece of this public event, which was attended by approximately 80 people, was a panel discussion featuring Jon Hoeber ’93 and Jon Turteltaub ’85, screenwriter and director of the summer blockbuster, The Meg, as well as Julia Zhu ’91, a media and entertainment expert and entrepreneur and CEO of Phoenix TV Culture and Live Entertainment Company. 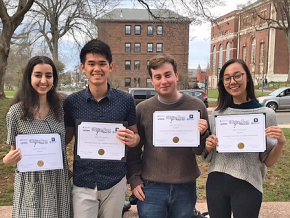 Roth moderated the discussion, titled, “Practical Idealism in Action,” in which the three alumni described how their liberal arts educations prepared them for successful careers in the entertainment industry. 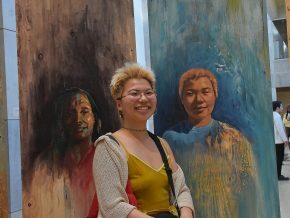 The three later shared insights into the future of film collaborations between the U.S. and China, in a conversation moderated by Higgins, who is also the Charles W. Fries Professor of Film Studies, chair of Film Studies, and curator of the Wesleyan Cinema Archives. Higgins also offered a simulated film studies class for prospective students and others in the audience—bringing the Wesleyan liberal arts film education experience to Shanghai. Front row, from left, Julia Zhu ’91, Scott Higgins, and President Michael Roth. It was a typical graduation on Aug. 1, 2018: tasseled mortarboards and academic gowns, faculty in academic regalia, proud family members, the strains of “Pomp and Circumstance,” speeches—some recalling challenges; others looking toward further success—diplomas, handshakes, smiles for the cameras, and bear hugs of congratulations. 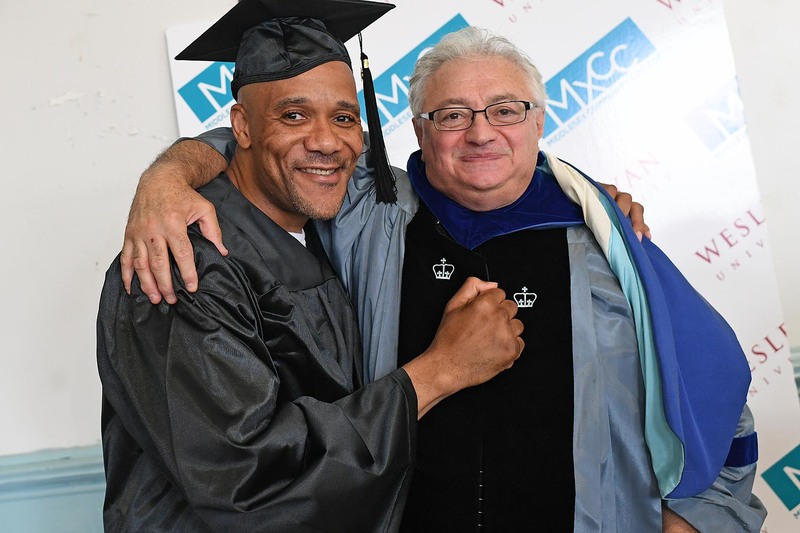 It was a graduation like none other: held in Cheshire Correctional Institution, it was the first time 18 incarcerated students in the maximum security prison received associate’s degrees through an innovative collaboration between Wesleyan University’s Center for Prison Education and Middlesex Community College. 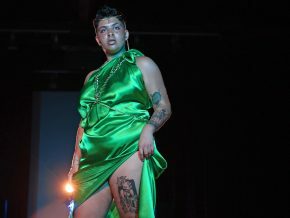 A week earlier, a similar graduation had taken place in York Correctional Institution, with six women donning caps and gowns to receive their associate’s degree diplomas. Since 2009, CPE has offered accredited Wesleyan courses to students at Cheshire Correctional Institution, a maximum-security prison for men. 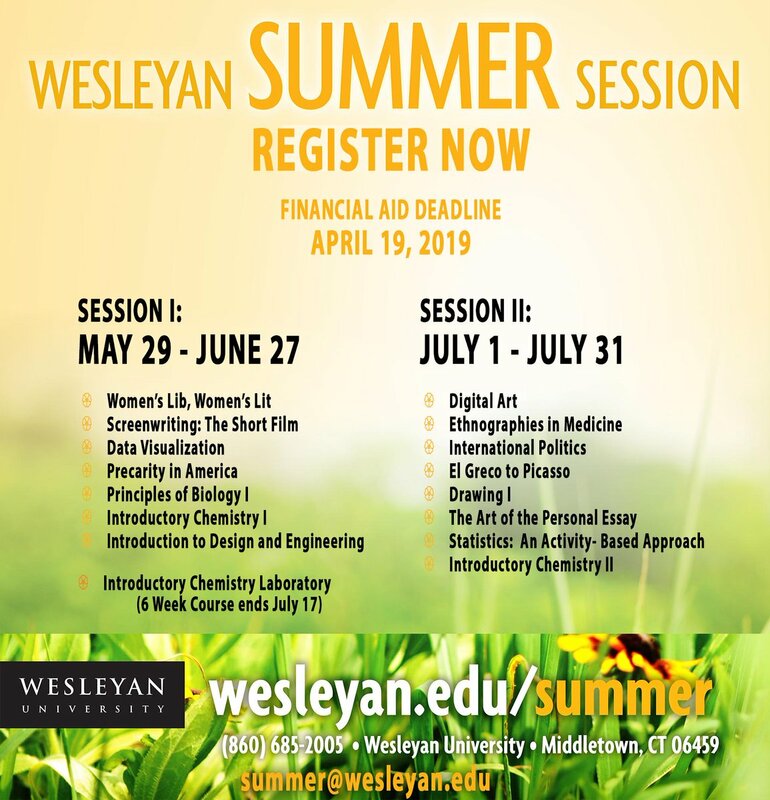 Wesleyan faculty teach courses ranging from English to biology to philosophy, which have the same rigor and expectations as courses on Wesleyan’s Middletown campus. 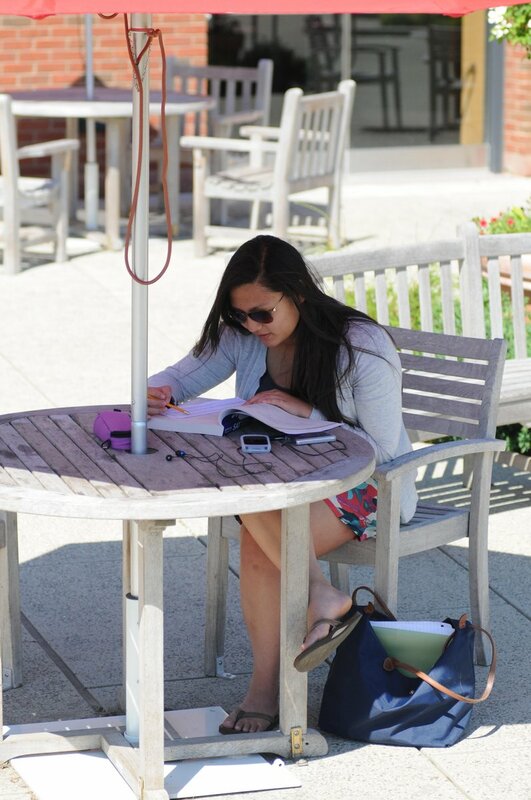 About 50 Wesleyan students volunteer in the program each semester, working in study halls at the prison or on campus filling research requests and serving as project assistants. The program was expanded to serve incarcerated students at York Correctional Institution in spring 2013. In this op-ed, President Michael S. Roth ’78 expresses his hope that this year’s graduates will feel empowered, and their capacity for inquiry, compromise, and reflection will be enhanced by their college educations. “[Amy] Bloom’s [’75] lyrical novel, laced with her characteristic wit and wisdom, celebrates love in its fiery and also embered phases,” according to this positive review of Bloom’s newest book, White Houses. 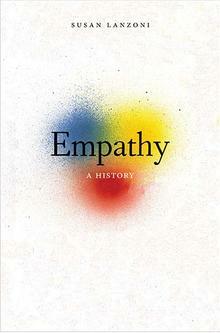 Bloom is the Shapiro-Silverberg Professor of Creative Writing at Wesleyan. Makaela Kingsley ’98, director of the Patricelli Center for Social Entrepreneurship, is interviewed about her career path, her goals for the future, and lessons she’s learned along the way. Ahmed Badr ’20 is interviewed about his experience as a young refugee from Iraq living in the United States. Badr has traveled the world telling his story and runs a project promoting youth storytelling as a means of self-empowerment. Meredith Hughes talks about how we understand planet formation, and how the relatively new Atacama Large Millimeter/submillimeter Array (ALMA) is “revolutionizing our view” of planet formation. Associate Professor of History Jennifer Tucker discusses the history of artists and scientists “pitting their fields against one another,” dating back to the emergence of meteorology as a scientific discipline in the 19th century. Tucker is also chair and associate professor of feminist, gender, and sexuality studies; associate professor of science in society; and associate professor of environmental studies. “Warner Bros. announced on Thursday that it will release the film adaptation of Lin-Manuel Miranda’s Tony-winning musical “In The Heights” on June 26, 2020.” This is the musical Miranda began writing as a Wesleyan undergrad. In this NPR show, Colorado Governor John Hickenlooper is asked introductory questions (“So we researched this—you are the first brewer to be elected to office, elected to be governor, since Sam Adams. You know that?”) that also flirt with his potential interest in running for president in the 2020 election. He is then invited to play a three-question quiz to win a prize for a listener.